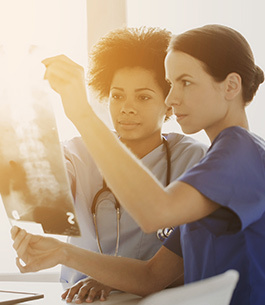 A complete review of your medical history and a physical examination are necessary before our spine experts can provide you with a diagnosis and design a personalized treatment plan. There are many possible causes of pain, which makes it important for our spine doctors to rule out possible causes and find the most likely one. After the physician has a better idea of what is contributing to your discomfort, diagnostic tests of some sort may be recommended. Have you had an injury or surgery to your back or neck? Spine and neck motion: Is there pain when you twist, bend, or move? If so, where? Have you lost some flexibility? Weakness: Your muscles will be tested for strength. You might be asked to try to push or lift your arm, hand, or leg when light resistance is put against them. Pain: The doctor may try to determine if you have tenderness of certain areas. Sensory changes: Can you feel certain sensations in specific areas of the feet or hands? Reflex changes: Your tendon reflexes might be tested. Common areas include under the kneecap and under the Achilles tendon on your ankle. Motor skills: You might be asked to do a toe or heel walk. Special signs: The physician will also check for any red flags that could indicate something other than spinal or vertebrae problems. Some signs of other problems include tenderness in certain areas, a fever, an abnormal pulse, chronic steroid use (leading to loss of bone mass), or rapid weight loss. An X-ray is a painless imaging procedure used to take pictures of your bones. X-rays can be used to see changes in bone, so they will almost certainly be used if your doctor suspects that you have a fracture, bone infection, or tumor. During an X-ray, you will be asked to lie very still on a table and hold certain positions while photographs are taken of your spine. Unlike an X-ray, an MRI scan does not use radiation. By using a combination of magnetic and radio waves, an MRI scan creates images that can be viewed on a computer. The scan is able to cut through multiple layers of the spine and show any changes in soft tissues such as nerves and ligaments. MRI scans can also be used to verify loss of water in a disc, enlargement of a facet joint, stenosis (narrowing of the spinal canal), or to determine if a disc has herniated. During an MRI test, you will lie on a table that slides into a machine with a large, round tunnel. The machine’s scanner then takes many pictures that are monitored by a technician and recorded. Some newer MRI machines are likely to be more comfortable for people who are uncomfortable in closed spaces. 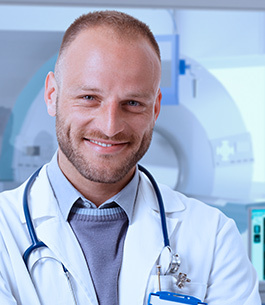 The MRI procedure generally takes anywhere from 30 to 60 minutes. CAT scans are similar to MRIs and X-rays because they can show both bones and soft tissues. CAT scans are also able to produce X-ray “slices” taken of the spine, allowing each section to be examined separately. A CAT scan can also show disc problems and bone damage. CAT scan images are not always as clear as X-ray or MRI images. To make the soft tissues easier to see, the CAT scan is often combined with a myelogram. Like an MRI, you will lie on a table that slides into a scanner during a CAT scan. The scanner is like an X-ray tube that rotates in a circle and takes many pictures. The CAT scan procedure takes between 30 and 60 minutes. A myelogram (my-low-gram) is a test used to examine the spinal canal and spinal cord. This test requires a special X-ray dye to be injected into your spine by a doctor. This is done by inserting a small needle in the lower back and into the spinal canal. When the myelogram is taken, the dye outlines the spinal cord and nerve roots so that disc and bone problems can be seen. To conduct the myelogram, the patient lies on a tilting table. As the table tilts, X-rays are taken to show the flow of the dye through the spinal region, helping doctors look for problems that may be due to a herniated or bulging disc, lesions, tumors, or an injury. The myelogram is often combined with a CAT scan to get a better view of the spine. In many cases, the MRI has replaced both the myelogram and the CAT scan. Sometimes the myelogram still shows problems more effectively than the MRI, but today it is used less frequently than MRI scans. Bone scans can be used to locate problem areas in the spine. The bone scan works by injecting a radioactive chemical, sometimes called a “tracer,” into the bloodstream. The chemical will attach itself to areas of bone that are undergoing rapid changes. Over a period of several hours, the tracer accumulates in the problematic area, making it easier to see with a special camera. A bone scan is very useful when it is unclear exactly where the problem is. The ability to take a picture that lights up the area where the problem seems to be coming from allows the doctor to pinpoint where to look next. After locating the problem areas, other tests can be done to provide the doctor with more information. The bone scan can identify problem areas such as bone tumors and compression fractures. A bone scan can also be used to evaluate a patient’s bone density. An electromyogram (EMG) is a test that looks at the function of the nerve roots leaving the spine. The test is done by inserting tiny electrodes into the muscles of the lower extremity. By looking for abnormal electrical signals in the muscles, the EMG can show whether a nerve is being irritated or pinched as it leaves the spine. Think of how you would test a lamp’s wiring. If you place a working bulb into the lamp, and the bulb lights up, then you assume that the wiring is working properly. However, what if the bulb does not light up? You can safely assume that something is probably wrong with the wiring. The lamp may be unplugged, or a short circuit might have occurred. Using the muscles like the light bulb in the lamp, an EMG is able to determine the condition of the nerves that supply those muscles, just like the wiring on the lamp. If the EMG machine finds that the muscles (the light bulb) are not working properly, the doctor can assume that the nerves (the wiring) must be getting pinched somewhere. Somatosensory evoked potential (SSEP) is a test that shows how well electrical signals travel from your body to your brain. The signals show whether the nerves that connect to your spinal cord are able to send and receive sensory information like pain, temperature, and touch. An SSEP indicates whether your spinal cord or nerves are being pinched. This test is helpful in determining how much the nerve is damaged, and whether there is a bone spur, herniated disc, or another source of pressure on your spinal cord or nerve roots. An SSEP is performed by placing an electrode over the skin or inserting a needle into the nerve or sensory center of the brain. The time it takes for an electrical signal to travel through the nerve pathway is then recorded. The function of the nerve is determined by the speed of the electrical signal. If the nerve pathway is pinched, then the signal travels slower than expected. The SSEP does not show exactly what is causing the problem, only that a problem exists. This is a limitation of the test. However, a positive result does tell your doctor where to look further, which is helpful. Problems detected by an SSEP may not be in the spine itself. A facet joint block is a procedure in which a local anesthetic medication (such as lidocaine or Novocain) is injected into the facet joint. This same type of medication is used by a dentist to numb your jaw, or by a doctor when stitching up a cut. The medication numbs the area around the facet joint. If this causes the pain to go away, then the doctor can assume that the facet joint is the source of the problem. Certain laboratory tests, such as a blood test, may be done to check for problems that are not related to deterioration of the spine. Such tests can help identify such problems as infection, arthritis, cancer, or aneurysm. A spinal tap is performed in order to get a sample of the cerebrospinal fluid that surrounds the spinal cord. The fluid is usually clear. It contains proteins, sugar, and other substances that can be found in the blood. It typically does not contain red blood cells or many white blood cells. A spinal tap checks the pressure and content of the fluid. Signals that there may be problems include evidence of bleeding, an increase in white blood cells, an increase in protein concentration, or inflammation. These symptoms could indicate infection, tumors, or a hemorrhage around the brain or spinal cord. To obtain the fluid sample, a needle will be inserted into the spinal canal in the lumbar region. A discogram is an X-ray examination of the discs between the vertebrae. This test is used to determine whether a disc is damaged and whether surgery is necessary. The test is performed by injecting dye into the center of the injured disc. The dye makes the disc clearly visible in the X-ray. In some cases, this test is better than a regular X-ray or a myelogram. The dye helps the doctor make an accurate diagnosis. With a discogram, you will be given medication to help you relax, then a local anesthetic will be administered. The procedure usually lasts about 40 minutes. Would you like to schedule an appointment with our Manassas spine doctors? Fill out the form below to get started.